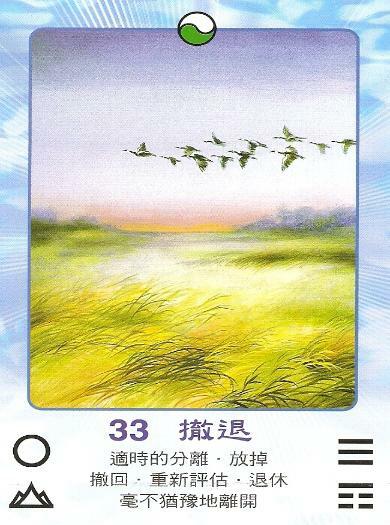 Today’s message starts with the fact that we’re dealing with a master number in the I-CHING Kua 33 and the first impression looking at the card image… what comes to my mind is “birds flying south for the winter”. It is fall, after all and many birds have already migrated—the question is how do they know when to migrate? How do we ourselves, in our own life, know when to migrate? Do we tune into the atmosphere around us and hear/see/feel the energy in such a way that we know when to make timely departures? Do we know when to retreat, let go, withdraw, retire, and walk away— any of those things? Or do we need to be pushed and shoved experiencing trauma in order to be encouraged to read the energy? Geese intuitively know when it is time to go. We could learn so much from the example of the deep intuitive sense that animals have… our own dogs and cats or other domestic animals can be awesome teachers and we could benefit from being more like them in certain respects. Today’s message is to get in touch with the inner whispers of the inner knowing by being in harmony with the TAO; with all energy that surrounds us. I was just thinking of a house guest who doesn’t know when it’s time to leave. I’ve had that happen so many times when I did readings for people in my home. So this is what the message is about today—being sensitive to the energy around you and knowing when it’s time to go or when it’s okay to remain where you are without having to experience that push or pull from life. We, as intelligent (for the most part) humans, sometimes rely too much on our intellect and abandon the right brain for the left. There’s something to say about the good old-fashioned animal instincts, you know? One of my teachers said that when we cover up our natural odor with perfumes and deodorant, we lose the ability to know who our natural partners are. She said that if you want to know if someone is going to be compatible with you to go for a hike with that person so that in perspiration you can use the olfactory sense to know if that person’s odor is attractive or repulsive. That’s one way to know if you should retreat and depart; some person’s natural scent will attract and others will repel us. Animals do this all the time, but we humans have forgotten about it. 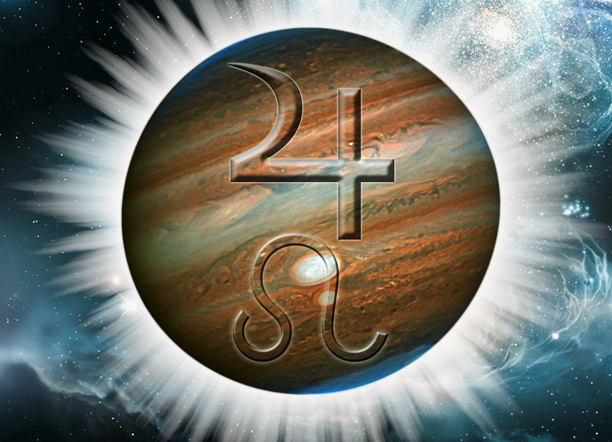 Sometimes, forgetting the intellect and using our intuition and instincts in these ways are highly beneficial in avoiding that 2×4! I love birds. They can’t over identify with any one home and are always flying off to new nests—there’s such freedom in that. Most birds have more than one nest because they know that any one of then can be destroyed at any moment. Well, that happened around here lately actually. The human “muggle” (term of endearment ~ LOL) who lives across the way cut down numerous trees any many birds lost homes—I feel consoled for them because of my knowledge that birds often have more than one nest and besides it’s the time of year that many birds have already flown south. So today we say that what you cling to or are attempting to cling to is contrary to life or to the TAO… energy must move on and holding fast to energy that must change because it is the very nature of life that energy changes, well, it brings suffering to hold to what is changing. By the way, the master number (33) is associated with the TAO, “All That Is” or some may say that which is god. And the I-CHING Kua 33 is called “Withdrawal, Retreat”. Another message for today is about retreating from negativity–one only exhausts oneself today when attempting to deal with and subdue negativity. It is better to yield ground and walk away; step back and avoid battles. Introspection and patience are better weapons. In order to read the energy one must quiet down, tune into the heart rather than the intellect, breathe deeply allowing one’s self to become sensitive and feel the energy. 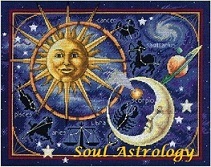 BOTTOM LINE: dispassionately evaluate the signs of change, sniff the wind in the air, what are you being shown about the energy around you? If it is time to go, spread your wings. If not, nestle in for a cozy winter season. We are approaching that season after all, we’re deeply into fall now… the days are growing shorter.